After all the off-season drama – including Alec Baldwin and Tracy Morgan's controversies – it's time for a new season of comedy. In the eight months since "30 Rock" last aired, pompous corporate titan Jack Donaghy got tossed off a plane for refusing to turn off his iPad, quit Twitter, flirted with running for mayor of New York – only to declare he’ll stay at his current job as long as NBC wants him. Then he rejoined Twitter. Tracy Jordan's offensive comedy act sparked a firestorm – and an apology. Liz Lemon had a baby and Kim Jong Il died. Okay, so all that really happened, variously, to Alec Baldwin, Tracy Morgan, Tina Fey and the fearsome North Korean dictator, who showed up on the program last season (via Margaret Cho in drag). But the off-season excitement seems oddly apt for a show that plays on a heightened level, mining laughs from manically paced, joke-a-second dialogue built around absurd situations with just enough of a root in our own absurd reality (Kim capturing Jack's wife and making her his mistress doesn’t seem all that off the wall) to keep us watching. After an extended gap between seasons, due to Fey’s blessed arrival, “30 Rock” returns to a somewhat altered TV comedy landscape. With "The Office" finding its balance in its transitory first post-Steve Carell season, "30 Rock" is poised to emerge as the strongest ensemble sitcom on network television. The show's first three seasons proved a high wire act, much like "Saturday Night Live," which gave "30 Rock" its premise and much of its talent. Viewers could be forgiven for asking how long could Fey and Co. keep up the constant quips, in-jokes (the Snapple product placement bit), stunt casting (Jerry Seinfeld, Oprah Winfrey) and cutaway gags far easier for a cartoon like "Family Guy" to pull off. The fourth season, which perhaps focused too much on Jack’s Nancy v. Avery love life dilemma, didn't work quite as well. But "30 Rock" came back strong last year, with highlights that included Matt Damon's turn as Liz's sensitive pilot boyfriend, Jack becoming a dad – and creepily turning NBC page Kenneth into a substitute wife. The season also brought the program’s 100th episode, in which “TGS,” the show within a show, escapes cancelation to reach its own 100th installment – a comic rejoinder to those who thought “30 Rock” would never make it near that far. 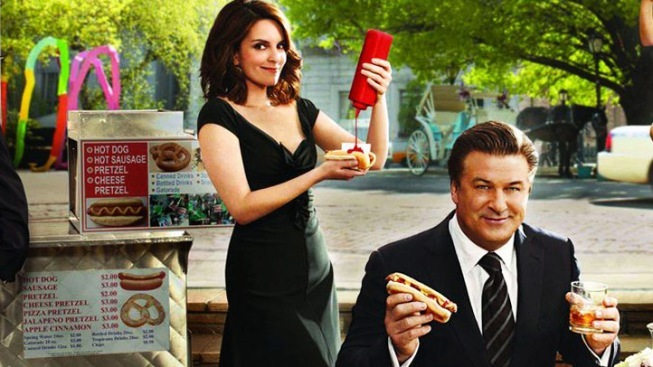 Reaching the century mark also paved the way for the show to go into syndication this past fall, exposing "30 Rock" to the larger audience it deserves and hopefully drawing additional viewers this season. The new 8 p.m. timeslot might help the cause, too.